Aflox Eye Drops is a sterile ophthalmic solution. It is a fluorinated carboxyquinolone anti-infective for topical ophthalmic use. 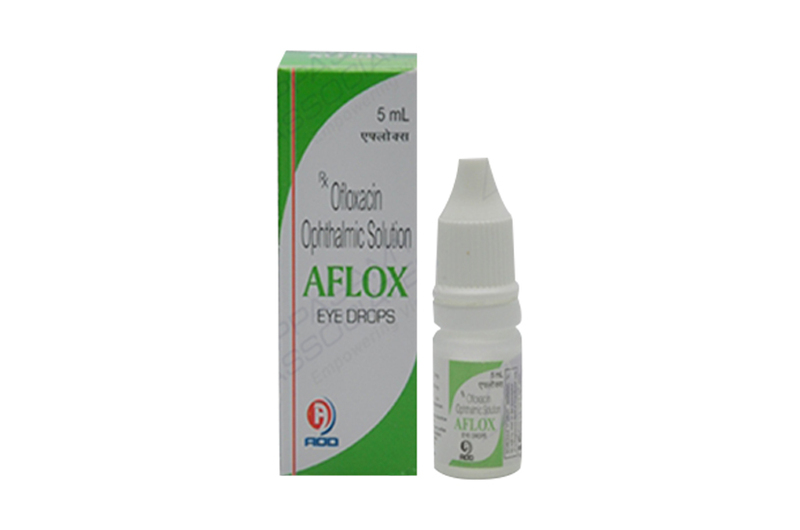 Ofloxacin Ophthalmic Solution is unbuffered and formulated with a pH range - 6.0 to 6.8. Primary packing - 5ml Clear Poly bottles White caps &Nozzles. 5ml in clear poly bottles with white caps & nozzles in properly sealed. Aflox Eye Drops is used in the treatment of bacterial infections. Aflox Eye Drops are an antibiotic. It kills bacteria by inhibiting the DNA replication. CONTRAINDICATIONS: Aflox Eye Drops is contraindicated in patients with a history of hypersensitivity to ofloxacin, to other quinolones, or to any of the components in this medication. Days 1 and 2 nstill one to two drops into the affected eye every 30 minutes, while awake. Awaken at approximately four and six hours after retiring and instill one to two Drops. Days 3 through 7 to 9 Instill one to two drops hourly while awake. Aflox Eye Drops is supplied in 5ml Clear Poly bottles packed with printed labeled in a unit carton and, Such 25 Carton Packed in a Shrink Sleeves.Such 12 shrinks packed in a shipper.